Located on the corner of Italy’s boot, the Puglia wine region runs from just below the mid-calf to the bottle of the heel. 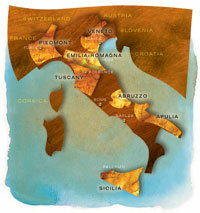 It’s no surprise that wines from northern and southern Puglia are quite different. Puglia can be roughly subdivided into three sub-regions; Foggia in the north, Bari and Taranot in the middle and Lecce in the south. Puglia has a number of environmental assets which help encourage vine growth. With warm Mediterranean climate, plenty of sunshine and a touch of sea breeze, the environment is ideal of viticulture.